TODAY: The deal ships $1MM in international bonus availability to Toronto, per Shi Davidi of Sportsnet.ca (via Twitter). YESTERDAY, 7:40pm: Slusser reports that the Jays are covering more than $10MM of the $12MM remaining on Morales’ contract. 7:06pm: The two teams have announced the trade. Toronto is sending Morales and cash to Oakland in exchange for minor league infielder Jesus Lopez and international bonus money. To clear a spot on the 40-man roster, Oakland transferred right-hander Jharel Cotton to the 60-day injured list as he recovers from Tommy John surgery. 7:02pm: In a surprising move, the Blue Jays have traded designated hitter Kendrys Morales to the Athletics, reports Jeff Passan of ESPN (via Twitter). The 35-year-old Morales is earning $12MM in the final season of a three-year, $33MM contract with the Jays, so presumably Toronto is providing substantial financial relief in the deal. Oakland recently lost first baseman Matt Olson when the slugger underwent a hamate excision procedure on his right hand. Olson suffered the injury in the second game of the Athletics’ two-game set against the Mariners in Tokyo. With Khris Davis locked in as the primary designated hitter in Oakland, it seems likely that Morales will play first base while Olson is sidelined. Susan Slusser of the San Francisco Chronicle tweets that Olson will be out anywhere from six to eight weeks. Morales won’t match Olson’s offensive output or especially his glovework, but the veteran switch-hitter is coming off a solid 2018 rebound campaign in which he batted .249/.331/.439 (112 OPS+) with 21 homers. His recent work at first base has been extremely limited, as he’s logged just 30 games at the position over the past two seasons. The A’s also have Mark Canha and Jurickson Profar (who played 24 games at first base last year in Texas) as alternative options at first base should the need arise. The addition of Morales will also help to balance out a righty-heavy Athletics roster. Prior to the trade for Morales, switch-hitters Profar and Robbie Grossman were the only two players on the active roster capable of hitting left-handed. A career .264/.328/.468 hitter against right-handed pitchers, Morales isn’t exactly a standout but will present a sound platoon partner for the right-handed-hitting Canha. For the Blue Jays, the move creates some much-needed roster flexibility. Teoscar Hernandez can now receive semi-regular at-bats in the DH slot, with Billy McKinney, Kevin Pillar and Randal Grichuk lining up around the outfield. The Jays can also rotate some other regulars through the DH slot, and the trade of Morales could even create a path to the Majors 24-year-old first baseman Rowdy Tellez on the heels of a .280/.308/.600 showing in Spring Training. The return for the Jays, as one would expect when dealing a soon-to-be 36-year-old DH in the final season of an undesirable contract, is minimal. The 21-year-old Lopez spent the 2018 season with Class-A Beloit, where he hit .239/.293/.402 with 10 homers, 15 doubles and a couple of triples in 326 plate appearances. He spent time at third base (587 innings), shortstop (65 innings) and second base (53 innings). Lopez wasn’t ranked among the Athletics’ top prospects. The amount of international money picked up by Toronto in tonight’s deal isn’t clear, though international funds must be traded in blocks of at least $250K. Blue Jays designated hitter Kendrys Morales and right-hander Marco Estrada have both gone unclaimed on revocable trade waivers and are now eligible to be traded to any team, Jon Heyman of Fancred reports (on Twitter). It’s not a surprise to see either player clear, given the relatively sizable amounts remaining on each player’s contract. Morales is in the second season of a three-year, $33MM contract in Toronto. While he’s recently gone through a near-historic hot streak at the plate, homering in seven consecutive games to boost his overall batting line to a strong .261/.342/.480 with 21 long balls, he’s still a 35-year-old DH owed about $13MM through the end of the 2019 season. As for Estrada, he’s struggled through back issues and performed poorly of late, pitching to a 6.53 ERA with a 19-to-15 K/BB ratio across eight starts (30 1/3 innings). He’s on a one-year, $13MM contract and is owed about $2.36MM of that total through the end of the year — a hefty sum for perhaps six starts from an ailing 35-year-old. The Blue Jays could always add some cash in order to help facilitate a trade involving either player, though it’d require a rather sizable sum in the case of Morales — recent hot streak notwithstanding. The Brewers and Mariners are among the teams that have been connected to rotation upgrades in recent weeks, though it’s not clear whether either organization will ultimately find a deal to their liking. It’s tougher to see any sort of market for Morales developing, though the Jays certainly figure to gauge interest over the next couple of days. Kendrys Morales set a new Blue Jays team record Sunday by homering in his seventh consecutive game. With one more long ball on Monday against the Orioles, Morales will tie the MLB record of an eight-game homer streak, shared by Ken Griffey Jr., Don Mattingly, and Dale Long. The streak highlights a rather remarkable turnaround to Morales’ season, one that seems directly tied to his decision to stop wearing the glasses he donned for the first six weeks of the 2018 campaign. After posting a .499 OPS over his first 109 plate appearances, Morales has quietly been one of baseball’s hottest hitters, with a .308/.380/.560 slash line over his next 284 PA. 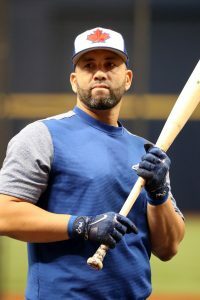 There aren’t any AL contenders with a glaring need for a DH-only player like Morales at the moment, so while a trade before the end of August is unlikely, Morales’ revival could give Toronto at least some hope of moving him in the offseason, even if the Jays have to eat some of his $12MM 2019 salary. Relievers were the only position group that seemed immune to last offseason’s stalled free agent market, as several bullpen arms scored lucrative multi-year contracts. Looking ahead to this winter, however, the New York Post’s Joel Sherman wonders if the bullpen market could also begin to suffer, in no small because so many of the relievers who signed those big contracts last offseason have struggled in the first year of their deals. This year’s free agent is headlined by such names as Craig Kimbrel, Andrew Miller, Zach Britton, and Cody Allen, though the latter three have seen their value diminish due to injuries or ineffectiveness. As of Saturday, Red Sox pitchers had a 3.08 ERA when Sandy Leon was catching, compared to a 3.84 ERA with another catcher. Leon’s game-calling and defensive abilities have made him a favorite of the Sox rotation, Jason Mastrodonato of the Boston Herald writes, and the team hasn’t lost a beat with Leon taking the bulk of playing time with Christian Vazquez on the DL. Mastrodonato’s piece also delves into Leon’s early development as a player, and how his quick grasp of English helped him easily learn how to work with pitchers. The Red Sox seem to be inclined to carry the out-of-options Blake Swihart on the active roster to open the season, Evan Drellich of NBC Sports Boston reports. While the club obviously feels it doesn’t want to lose out on his upside, that decision would also create some constraints elsewhere — perhaps forcing the Sox to make a move instead with one of their utility infielders. Indeed, as Sean McAdam of the Boston Sports Journal writes (subscription link), the Sox have begun putting out feelers with other organizations regarding Deven Marrero (who is also out of option) and Brock Holt. While it’s not clear that either has drawn significant interest, it seems the team is preparing to move one of them or another similar player as part of its roster-maintenance efforts at the tail end of camp. Manny Machado’s move back to shortstop was inspired by his love for the position, the Orioles star tells ESPN.com’s Jerry Crasnick, not as a way to better position himself for free agency next winter. “I think a lot of people are saying, ’He’s going over there because he wants more money or more value.’ It doesn’t come down to money or more value,” Machado said. “I’ve already established myself as a player. I’m worth what I’m worth already. It doesn’t matter if I’m at short or third. The transition over there is because that’s where my heart is. That’s what I do.” Machado’s preparation for the position switch included changes to his diet and offseason training regimen, and scouts have given promising early reviews about Machado’s defensive prowess at shortstop. Kendrys Morales lost weight in the offseason and is hoping to adjust his swing so that he hits fewer grounders in 2018, Ben Nicholson-Smith of Sportsnet.ca writes. Due to his lack of speed and opposing fielders playing the shift, Morales grounded into 22 double plays last season, which helped contributed to his below-average 97 wRC+ despite 28 homers and lots of hard contact. The subpar offensive performance and Morales’ lack of defensive contributions made him a sub-replacement level (-0.6 fWAR) player in his first year with the Blue Jays. Former Yankees pitcher and Mets, Astros, Yankees and Mariners pitching coach Mel Stottlemyre Sr. is “fighting for his life,” one of his sons, former big-league pitcher Todd Stottlemyre, writes on Facebook (via ESPN). Mel Stottlemyre, 75, announced in 2000 that he had been diagnosed with multiple myeloma. Stottlemyre was the Mets’ pitching coach for their World Series win in 1986, and the Yankees’ pitching coach for four World Series champion teams. He also won five All-Star berths in 11 seasons in the big leagues. We at MLBTR wish the best to the Stottlemyre family in this difficult time. Here’s more from the AL East. Edwin Encarnacion’s departure to Cleveland has many Blue Jays fans upset, with some blaming the team for not finding a way to re-sign Encarnacion and others blaming Encarnacion for seeking too much money early in the process, Sportsnet’s Shi Davidi writes in a fascinating timeline of the negotiations between Encarnacion and the Blue Jays. As had been previously reported, the Jays offered Encarnacion a four-year, $80MM deal in early November; Davidi notes that deal also included a vesting option that would have increased the value of the deal to $100MM. Encarnacion, though, didn’t want to take a deal on the doorstep of free agency (as his agent, Paul Kinzer, admitted earlier this week). As free agency opened, the Jays believed Encarnacion was seeking $100MM and judged from his lack of urgency to move on the Jays’ initial offer that he had another suitor in the $80MM-$100MM range, which wasn’t the case. The Jays thus moved quickly to sign Kendrys Morales, and took their $80MM offer off the table. The two sides remained in touch, but with Morales and Steve Pearce in the fold, the Jays weren’t as strongly motivated to sign Encarnacion, and he ended up with Cleveland.